This volume of Methods in Cell Biology, the first of 3 parts on the subject of zebrafish, provides a comprehensive compendia of laboratory protocols and reviews covering all the new methods developed since 2004. 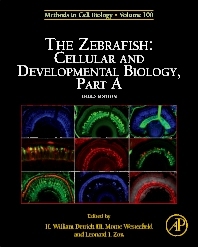 This first volume provides state-of-the-art descriptions of novel cellular imaging technologies and methods for culture of zebrafish stem cells, summarizes protocols for analyzingthe development of major organ systems including the central nervous system (CNS), and introduces the use of the zebrafish as a model system for human diseases. Developmental biologists, neurobiologists, and cell biologists. Professor of Biochemistry and Marine Biology at Northeastern University, promoted 1996. Joined Northeastern faculty in 1987. Previously a faculty member in Dept. of Biochemistry at the University of Mississippi Medical Center, 1983-1987.Principal Investigator in the U.S. Antarctic Program since 1984. Twelve field seasons "on the ice" since 1981. Research conducted at Palmer Station, Antarctica, and McMurdo Station, Antarctica.Research areas: Biochemical, cellular, and physiological adaptation to low and high temperatures. Structure and function of cytoplasmic microtubules and microtubule-dependent motors from cold-adapted Antarctic fishes. Regulation of tubulin and globin gene expression in zebrafish and Antarctic fishes. Role of microtubules in morphogenesis of the zebrafish embryo. Developmental hemapoiesis in zebrafish and Antarctic fishes. UV-induced DNA damage and repair in Antarctic marine organisms.